16 April 1949: At Van Nuys Airport, California, test pilot Tony LeVier and flight test engineer Glenn Fulkerson made the first flight of the Lockheed YF-94 prototype, serial number 48-356. The aircraft was the first jet-powered all-weather interceptor in service with the United States Air Force and was the first production aircraft powered by an afterburning engine. Two prototypes were built at Lockheed Plant B-9, located on the east side of Van Nuys Airport. 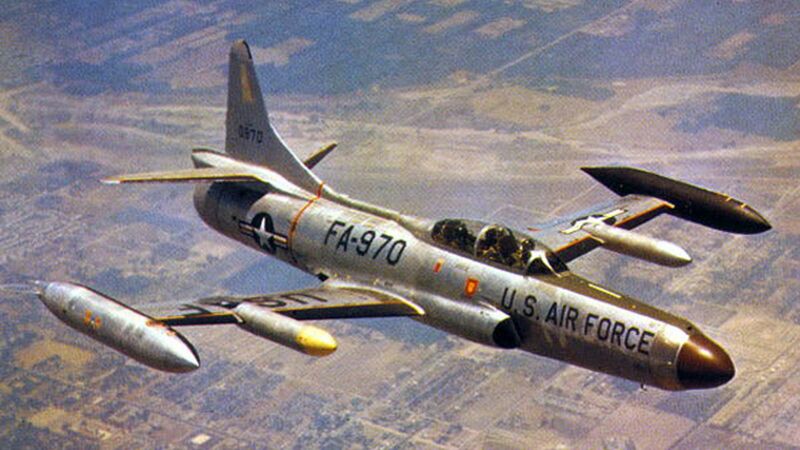 Two TF-80C-1-LO (later redesignated T-33A) Shooting Star two-place trainers, 48-356 and 48-373, were modified with the installation of air intercept radar, an electronic fire control system, radar gun sight, four Browning AN-M3 .50-caliber (12.7 × 99 NATO) aircraft machine guns and a more powerful Allison J33-A-33 turbojet engine with water-alcohol injection and afterburner. The rear cockpit was equipped as a radar intercept officer’s station. It was initially thought that the project would be a very simple, straightforward modification. However, the increased weight of guns and electronics required the installation of a more powerful engine than used in the T-33A. The new engine required that the aft fuselage be lengthened and deepened. Still, early models used approximately 80% of the parts for the F-80C fighter and T-33A trainer. The Air Force ordered the aircraft as the F-94A. 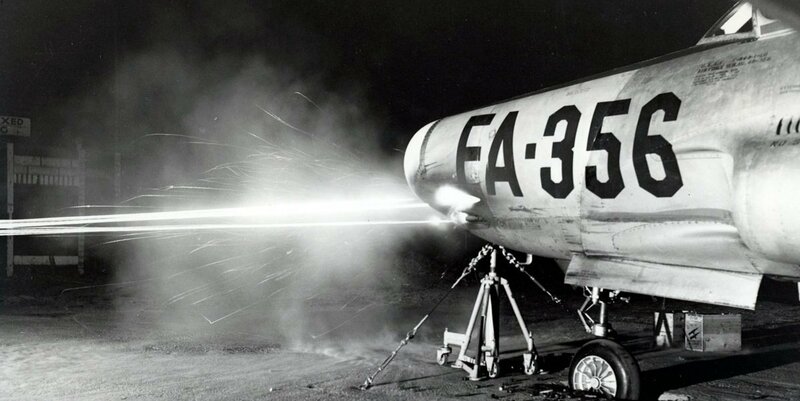 Improvements resulted in an F-94B version, but the definitive model was the all-rocket-armed F-94C Starfire. The Allison J33-A-33 was a single-shaft turbojet engine with a single-stage centrifugal-flow compressor, 14 combustion chambers and, a single-stage axial flow turbine. The engine was rated at 4,600 pounds of thrust (20.46 kilonewtons) and 6,000 pounds (26.69 kilonewtons) with afterburner. The J33-A-33 was 17 feet, 11.0 inches (5.461 meters) long, 4 feet, 1.3 inches (1.252 meters) in diameter and weighed 2,390 pounds (1,084 kilograms). 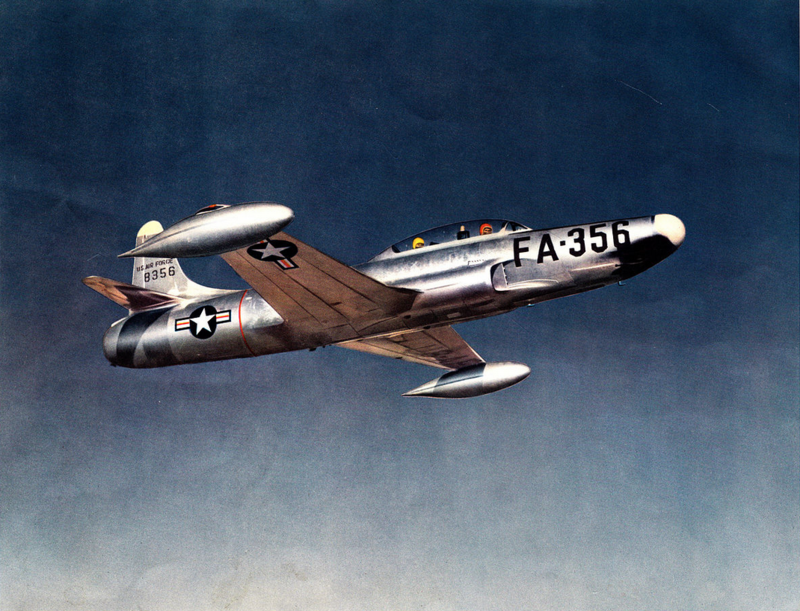 Originally a P-80C Shooting Star single-place fighter, 48-356 had been modified at Lockheed Plant B-9 in Van Nuys to become the prototype TF-80C two-place jet trainer (the designation was soon changed to T-33A), which first flew 22 March 1948. It was then modified as the prototype YF-94. 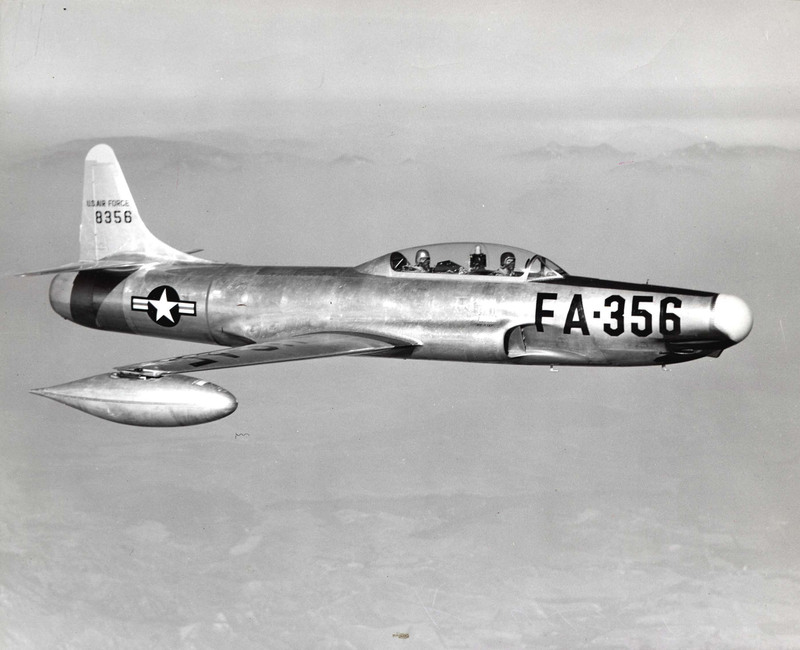 48-356 was later modified as the prototype F-94B. It is in the collection of the Air Force Flight Test Museum, Edwards Air Force Base, and is in storage awaiting restoration.